Today's review is for a bar I've had in the archives for a while, the Great Taste Award winning Chocolate and Love Organic Filthy Rich, which is fairtrade, suitable for vegans, contains 71% cocoa solids and is available from Sainsbury's. I chose the bar purely based on the name - I do love some rich dark chocolate! (I've previously reviewed their Coffee Dark Chocolate here). I've tried a few brands of dark chocolate over the years and I have to say this is definitely one of the better ones. The chocolate is great quality, tasting...rich (thank goodness!) and flavoursome as well as sweet and smooth. It has a nice balance of all elements, so it's neither too bitter nor too sweet, and certainly doesnt lack flavour. I can see why it's won awards! As much as I like Green & Blacks for their 85% dark chocolate this is a step above. It's hard to find a good brownie when you're gluten free, but over time there's been an increase in the quality of gluten free products. Costa's Gluten Free Brownie is probably the best, and Aldi's Gluten Free Brownies are also pretty great too. 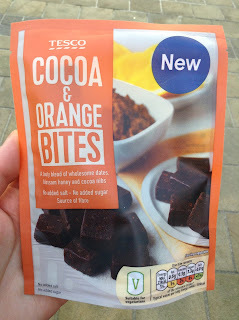 When I spotted these Tesco Finest Belgian Chocolate Free From Brownies I wondered if they'd be just as excellent - Tesco do have a reputation for some tasty products in their Finest range after all. Containing pieces of Belgian white chocolate, these come in hefty thick chunks and are perfectly stodgy when bitten into - the perfect texture in fact, not too gooey and not too firm. I loved them. Taste wise they were delicious, very rich with a lot of cocoa flavour, and the white chocolate breaking up the taste with hints of creaminess. 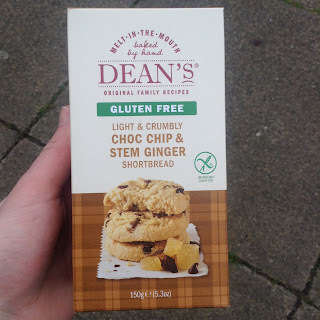 I really enjoyed these; they felt like a luxurious treat especially for gluten free brownies! Today's review is for a bar not many may have tried due to its very high cocoa content. 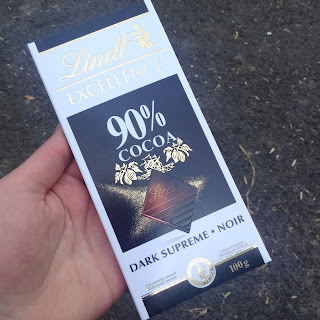 It can be somewhat bitter to those who aren't used to it, even lovers of 70% chocolate may find it overpowering, but it's one I often end up eating when trying to reduce my sugar intake but still need a little choccy fix. It's currently on offer for £1.50 in Tesco stores so I've been buying it quite a lot recently. It comes in the same style blocks as all Lindt Excellence bars, with the Lindt logo printed on and with a nice glossy finish. There's vanilla in the ingredients which gives it a subtle, smooth aftertaste. I have to say I do enjoy these bars for a richer chocolate fix, they're not quite as flavoursome as Green & Blacks but they're still pretty rich and smooth. The vanilla is the key ingredient that prevents these from tasting too bitter. A few squares is definitely all you need though, any more than that and it becomes a bit too much! 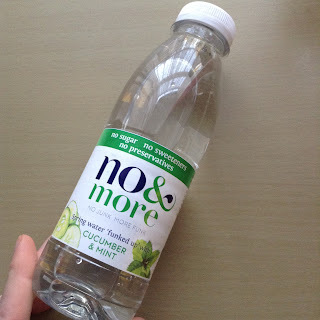 A big thank you to No & More for sending me some of their new drinks range to review recently. I've previously reviewed their NuVa Watermelon Water and enjoyed it, so was thankful indeed when they sent me this newly revamped range. They've changed their name from NuVa to No & More to better communicate what their range is all about, which is a good move in my opinion. Their waters are all sugar-free and only contain natural flavourings, making them suitable for any diet. The Cucumber and Mint variety shown above was...interesting. I'm not really a fan of cucumber and mint so I can't say I liked it that much, although I'm sure some people might find it refreshing. I'm afraid this gets a low 5 out of 10 as it's just not my kinda flavour. This is one I've had in the archives for a good long while now - I don't know how on earth I missed it! I'm usually quick to review anything new and Ritter related if I see it in a UK store, and this was one I snapped up at the bargain price of 69p in Heron Foods when they were on clearance. 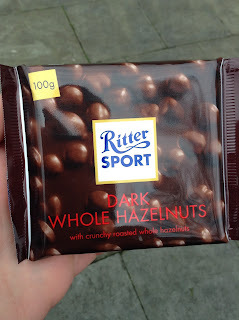 Containing whole hazelnuts and dark chocolate, this promised to be very special considering Ritter's track record with nutty chocolates. And combined with the dark chocolate they were perfect! Ok, maybe it's not as tasty as the milk or white chocolate versions, but for something a little less sweet and richer, this is a pretty tasty bar. You just can't beat Ritter's nutty bars...no other mainstream brand is quite on par. A shame they're not more widely available in the UK. 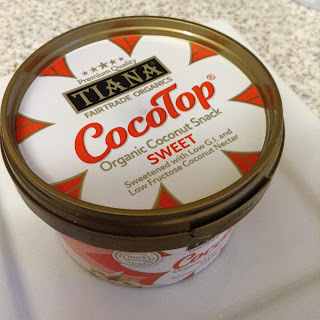 A big thankyou to Tiana Fairtrade Organics for today's post, who kindly offered me some of their new CocoTop "Organic Coconut Snacks" to review, an offer I couldn't refuse! There's two varieties in the range, which is available from Amazon in 50g pots. You can buy both varities together or the Savoury and Sweet versions by themselves. Both contain only natural ingredients, are suitable for vegans, organic and gluten-free. They're lightly toasted to reduce fat content. I tried the Savoury variety first, which are coconut chips "lightly salted with unrefined sea salt". I do like the little tubs these come in, they're super handy, and unlike other coconut chips on the market you can re-seal them and save some for later. No messy bits falling out into your bag! Since Ben & Jerry's launched their Non Dairy Ice Creams in the UK (check out my review of the Non Dairy Chunky Monkey here), it seems that Vegan and Dairy Free products are finally making it into the mainstream. The options are variable, with the Ben & Jerry's Non Dairy range being pretty good, whilst the Alpro Non Dairy Ice Creams are rather poor in my opinion. 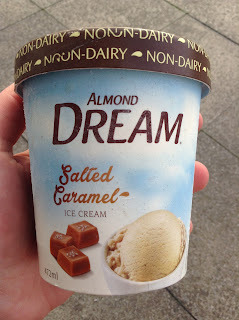 So how does this Non Dairy Ice Cream from Almond Dream compare? The range comprises of a few varieties, such as Mint Chocolate Chip and Velvety Vanilla, and is available from supermarkets such as Morrisons, Waitrose, Sainsbury's, Asda and Ocado.com. I saw the Salted Caramel variety reduced to £3 in Sainsbury's recently (it's usually between £4- £5) so thought I would give it a try. It's made with almonds, cane sugar, maltodextrin (from tapioca) and a few other fillers. I'm not a big fan of fillers in ice cream but I suppose being non-dairy it needs to be bulked up with something. Made with rice, potato and maize flour and butter, these also include dark chocolate chips and stem ginger pieces, for a nice warming spiciness. I don't usually go for ginger biscuits but on this occasion I couldn't say no since they were gluten free and so cheap. 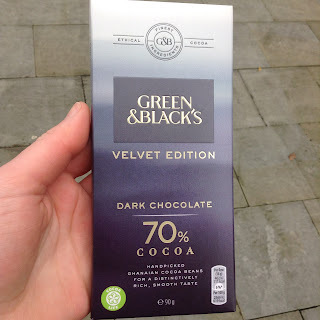 Another day, another review of Green & Blacks Velvet Edition. Why do I do this to myself? I should have learnt my lesson from trying the Velvet Edition Orange & Almond and Mint Dark Chocolate varieties, but as a dark chocolate lover I'm often tempted by special offers in supermarkets. When Green & Blacks 85% bar is on offer I'l buy it, but on this occasion the Velvet Edition range was on offer at £1.50 a bar in Tesco, so I thought I would see how the 70% tastes...naked so to speak, free from other flavours or nuts. When I'm on a health kick I do enjoy eating a lot of coconut butter. It's a healthy paleo fat that tastes sweet and is very filling to boot. I usually eat it right from the spoon, but sometimes I'll mix it with cocoa powder and make chocolatey snacks from it too. 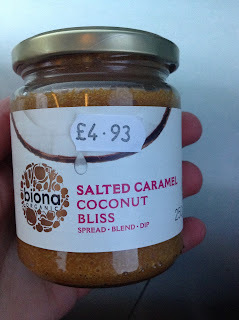 I've never known of any flavoured varieties so I was super dooper excited when I spotted this Salted Caramel Coconut Bliss made by Biona, in my local vegan store recently. It costs £4.93 which is a standard price for coconut butter, and is described as "our Salted Caramel Coconut Bliss is made from high quality coconut flesh blended with coconut milk, coconut nectar and pink Himalayan salt". A natural salted caramel coconut product, sounds like heaven! 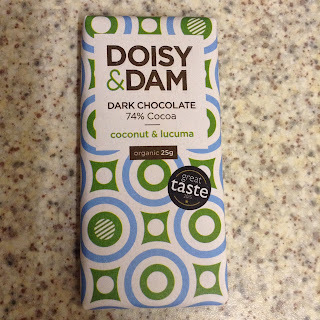 I always love a new chocolate bar variety, so when I spotted this mini bar of Doisy and Dam Dark Chocolate in a local Sainsbury's Express recently, straight into my basket it went. Costing £1 for 25g it certainly ain't cheap, but that's because it contains organic cocoa and has won a Great Taste Award. I had high expectations, especially since I've reviewed Doisy & Dam before - do check out my Doisy & Dam Maple, Toasted Rice & Pink Salt Review. This bar contains coconut flakes and vanilla as well as lucuma, which is a type of fruit with caramel undertones. There's 4 segments per mini bar. 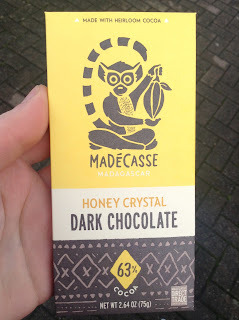 I do enjoy Madecasse chocolates, ever since I was introduced to them a few years back I've been a fan. Their range is made with Heirloom cocoa - "Earth's original and most flavourful variety of cocoa", which is quite the claim but may just be accurate. Madecasse work directly with farmers in Madagascar, making them "Direct Trade". To learn more about their story visit www.madecasse.com. Madecasse have changed their packaging recently, and I have to say I do prefer it over the previous look. There's now a monkey holding a cocoa pod on the front which is very fitting. This Honey Crystal variety caught my eye in a large Waitrose store - but it's also available from waitrose.com. I found it on special offer of £1.99, and if you hurry it might still be on offer! 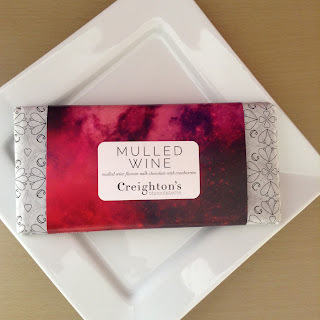 This is Part 2 of my Creighton's Chocolaterie festive reviews, do check out my review of their Mulled Wine Milk Chocolate from a few days ago. As well as that bar they sent me this Spiced Tangerine, described simply as a "citrus flavoured dark chocolate bar with spices". This is available from Fenwicks stores as well as Creighton's Website. They have a rather lovely range of festive chocolates indeed, such as Bucks Fizz Truffles, Chocolate Sprouts, and more...do check them out! 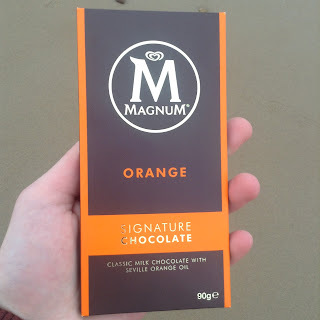 I do love a good dark chocolate, especially one with an orangey flavouring so I was very excited to try this. Opening the wrapper it certainly had a nice zesty aroma. I do like Creighton's Chocolaterie. They produce some excellent chocolate bars, with unique flavours that vary season by season. I enjoyed the Pumpkin Spice Latte Bar for Halloween, so was curious how their festive offerings would compare. 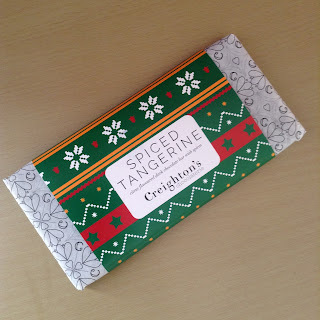 Luckily, Creighton's offered to send me two of their Christmas bars for a review. This Mulled Wine bar is described simply as "mulled wine flavour milk chocolate with cranberries" and is available from the likes of Fenwicks stores as well as Creighton's Website. They have a wide range of delightful festive goodies on there, from the likes of Gingerbread Latte Cups, Rum & Raisin Truffles and the rather special Planet Tree Decorations. The bar is paper wrapped like all Creighton's bars which gives it a nice special feel compared to plastic wrapping. The chocolate had a lovely mulled wine aroma amongst the creamy milk chocolate notes. For this festive season, rather than try every sweet product I can find I'm branching out a bit into a hopefully healthier direction. I'm not reviewing as many sweets but products suitable for general Christmas Gifts. Yay! I'm very excited because I do love a challenge, and there's so much cool stuff in shops aside from snacks. If there's anything you'd like to see reviewed, please do leave a comment and let me know what - I'll try my best to see if I can find it! 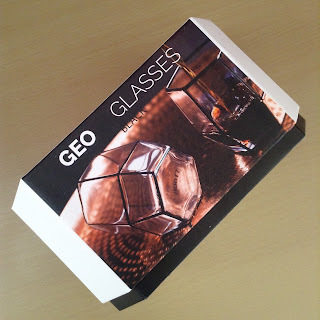 Today's review is for some super special glasses I was sent to review, sold by Root 7. I've seen some fancy whisky glasses in my time but none quite as special as these! Tesco are taking on Nakd Posh Bits with their own range of healthier snacks made with dried fruit, oats, nuts etc but at a lower price point. How do they compare? There's a few varieties in the range; Almond Bites, Cranberry, Coconut and Strawberry Bites and these Cocoa & Orange bites. The best thing about these is that they're nut free, so unlike Nakd Posh Bits are suitable for those with nut allergies - hurrah! Unfortunately though they're not suitable for vegans as they contain honey. Described as "A tasty blend of dates, blossom honey and cocoa nibs" and costing £1.50 for 110g, these come in cube shapes and felt a bit more substantial than Nakd Posh Bits. They have a slightly pale appearance thanks to a dusting of rice flour which isn't such a bad thing; it prevents them sticking together too much. 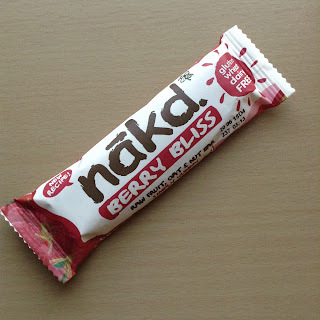 Amongst the Nakd bars I was sent recently were the New Recipe Apple Danish and Banana Bread bars, as well as these Berry Bliss and Cocoa Twist varieties. They're made with a mixture of oats, raisins, cashews, dates and "fruit extract" which consists of apple and carob. All are vegan and gluten free, as well as refined sugar free. Thankfully they're not flavour free! The Berry Bliss variety is lovely; so fruity thanks to the raspberries and strawberries, it feels like a real summery treat indeed, in fact it'd be perfect for the Wimbledon season! But it would also be good for those times in Winter when you want to remember the Summer months too, haha! 8 out of 10. The Cocoa Twist bar is a more simple affair, but very satisfying and has a nice rich cocoa flavour. It's the closest to a natural brownie bar you're going to get, and makes for a very filling snack. Highly recommended. 8 out of 10.